Here in Michigan the winters can be brutal. Last winter was one for the record books and the past few nights here the temperatures have plummeted below zero degrees. It is at this point when I am asking myself how I still live here, and subsequently check housing prices in The Keys. As with people, many dogs love the snow (my Eva girl seen below) and many dogs do not. It is our job as dog owners to keep them safe in these blustery winter months. Here are some tips to keep your dog safe this winter. My Eva would spend all day outside if I let her, but is best to limit yours dog's time outside. Do not allow your dog to be idle indoors, however, or they can/will act out. You can still take your dogs for walks, as weather allows, or find fun indoor games to keep their mind sharp. Teaching your dog a "find" command is great for those winter months. To do this, hide your dog's favorite toy or treat and have them search for it in the home. You should also consider your dog's coat type. 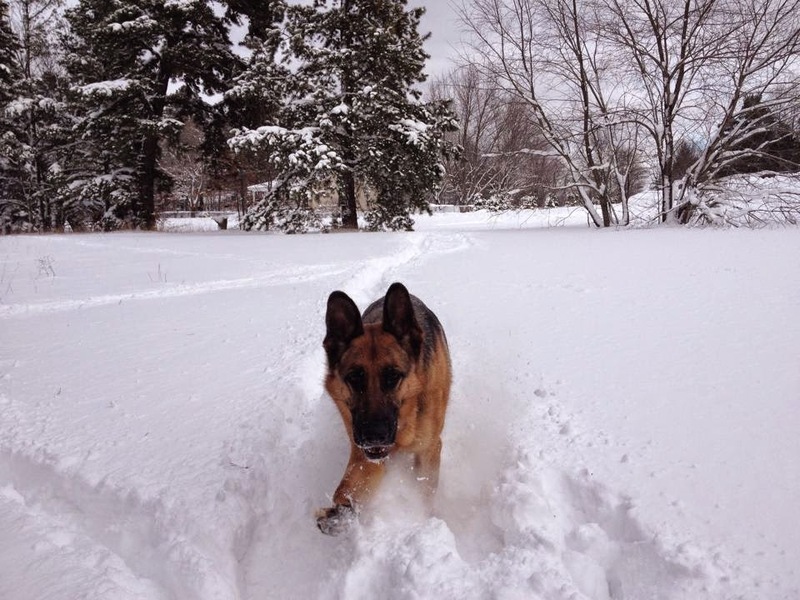 A German Shepherd Dog will be able to withstand colder temperatures better than a Pit Bull, as example. For those dogs with a short coat, a sweater or jacket may be a necessity. Consider windchill, it can threaten a pet's life. Dogs are at risk, just as humans are, for frostbite and hypothermia during extreme cold snaps. Exposed skin on noses, ears and paws can freeze quickly and suffer permanent damage. Keeping warm takes energy and burns calories. When your dog has spent a lot of time outside make sure to feed an appropriate amount of food and, as always, keep fresh water available. Buy pet friendly ice melt. The salt and other chemicals used in ice melt can irritate the pads of your dog's feet. Make sure to wipe all paws with a damp towel before your dog licks them and irritates their mouth. Antifreeze is a deadly poison, but it has a sweet taste that may attract dogs. Wipe up spills and keep antifreeze (and all household chemicals) out of reach of your dog. Coolants and antifreeze made with propylene glycol are less toxic to dogs and other pets. This one is not relevant to dogs specifically, although a small dog may do this. The warm engines in parked cars attract cats and small wildlife, who may crawl up under the hood. If you park outside, hit your car's hood to scare them away before starting your engine. If you see a dog (or any pet for that matter) left in the cold, document what you see. Important information to gather would be the date, time, exact location and type of animal, plus as many details as possible. I would also suggest video and/or photos. Contact your local animal control agency, in Muskegon County this happens to be the Sheriff's Department. Make sure you note with whom you speak and when. Then follow up in a few days if the situation has not been remedied. All over the world on every given day, a dog fight is taking place. Although rescue organizations are doing their very best to stop this cruelty, thousands, if not hundreds of thousands of dogs from all over the globe are being thrown into fighting rings. The sad thing is most of these dogs do not want to fight. They are thrown in as bait against another opponent, and whether the bait dog fights back or not, the fight continues. 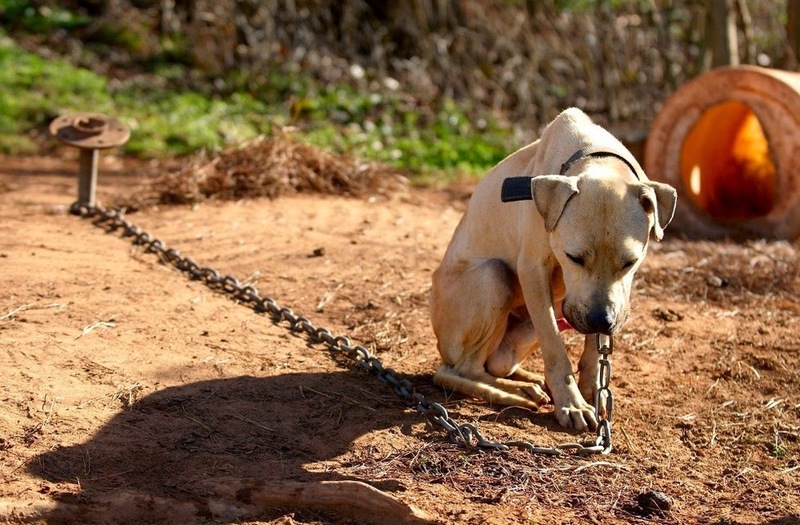 These dogs are usually very young, and kept chained outside to a tree, pole, or “shack” of a dog house. These animals have no connection with humans, other dogs, or the outside world. The only humans these dog know are the handlers walking them to the fighting ring. They do not get love or affection, they do not have toys or play mates, they do not go for walks or runs, these dogs are strictly used for human entertainment and money. Why does the public not hear more if these tragic events? Dog fighting rings are “underground” means of entertainment, found both in urban and rural areas. Often times, two dogs fight until the death. If the losing opponent has not died in the ring but suffers very serious injuries, the dog is usually euthanized (sometimes inhumanely by the dogs handler) instead of seeking medical attention that could be quite costly to the handler. Most of these dogs also never see a veterinary doctor, therefore they suffer their entire lives with gaping wounds, gashes to their flesh, holes through the meat of their bodies, and most often, bitten off ears and tails. These animals are put back in their cage or on their chain without medication or wound care. Food and water is a bare minimum, and most of the time when given, is not clean. If these dogs are not suffering from a dog fight, their living conditions, or the lack of water and food, they are simply withering away, frightened and alone. The object of this blunt but true post is to raise awareness of dog fighting rings and their dangers. We invite everyone to do their own research, read the true stories, and look at the real pictures. The words and images will show you the truth, one that we cannot deny, and one that we should all pull together and fight against. Please volunteer your time with rescue organizations to help in any way possible. If you ever suspect animal abuse in any way, please do not hesitate to call for help. Animal abuse is now a felony in most cases here in the U.S. Help us help these poor animals, and bring more of our babies back to loving homes.